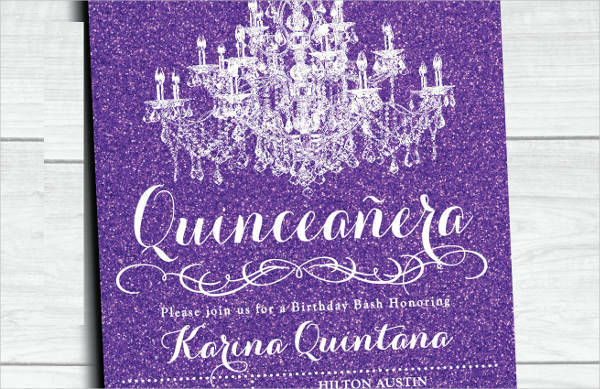 If you are planning to celebrate your Quinceanera party, you must be planning to send the quinceanera invitations to your guests. 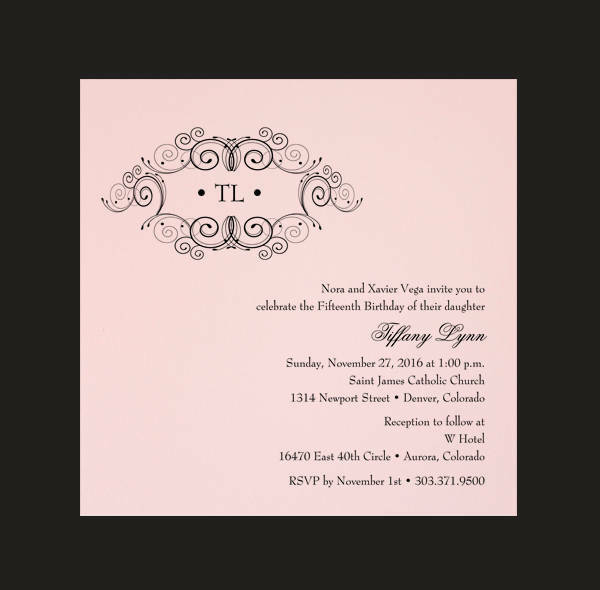 These days, both online and traditional ways of invitation are in vogue. 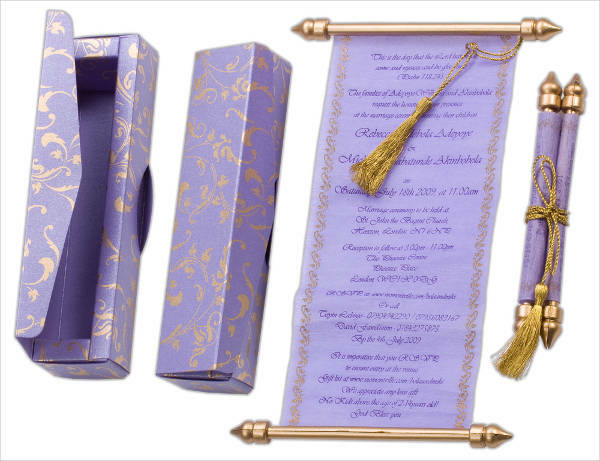 The invitation card designs are to be customized as per the aptitudes and budgets of individuals. 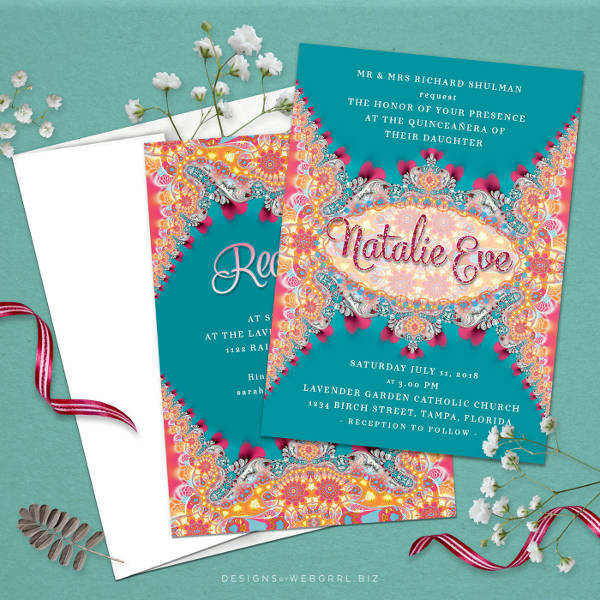 If you look out for new invitation ideas for the big day, you can check out fifteen Free Invitation Designs and these are available for free download. 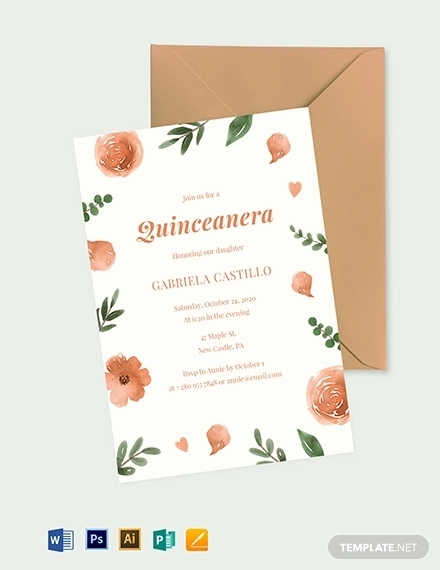 If you want to present the invitation cards to your guests in a special way, you may opt for these unique quinceanera invitations. They are features with floral patterns and have a beautiful background color. You may also see Party Invitations. 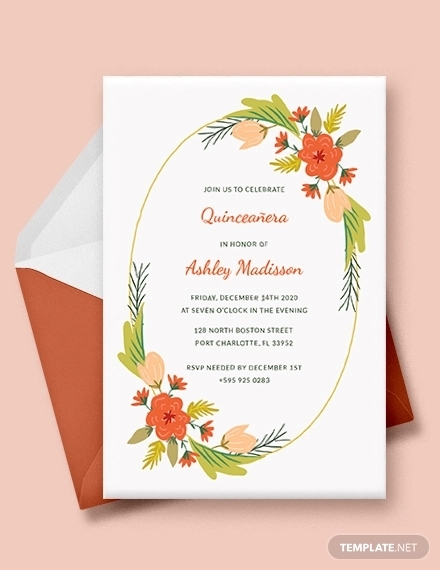 Flowers are one of the inherent aspects of invitations cards. You may choose a theme with bright and conspicuous flowers in the center, with a hand-written message at the bottom. You may also see Cheap Wedding Invitations. 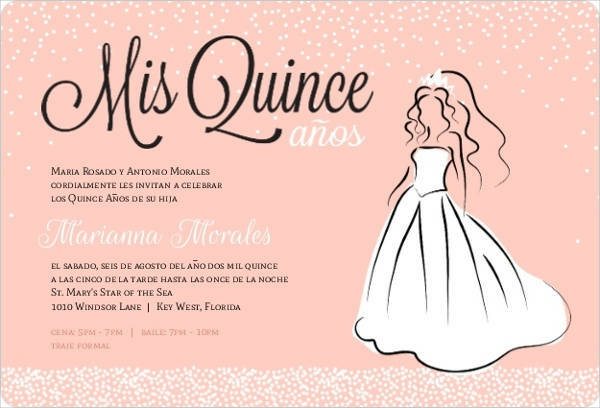 This is a beautiful Quinceanera invitation message. It has a scrolling system and the letter drops down while revealing the texts. The blue background color and the cursive fonts complement each other. These cards have a bright appearance. 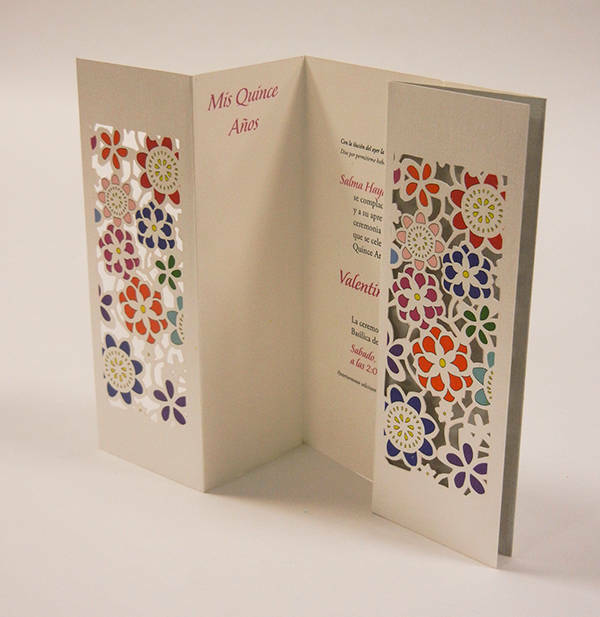 The red and white color combination in the card is ideal for the occasion. There are stars and floral designs at the bottom of the card. 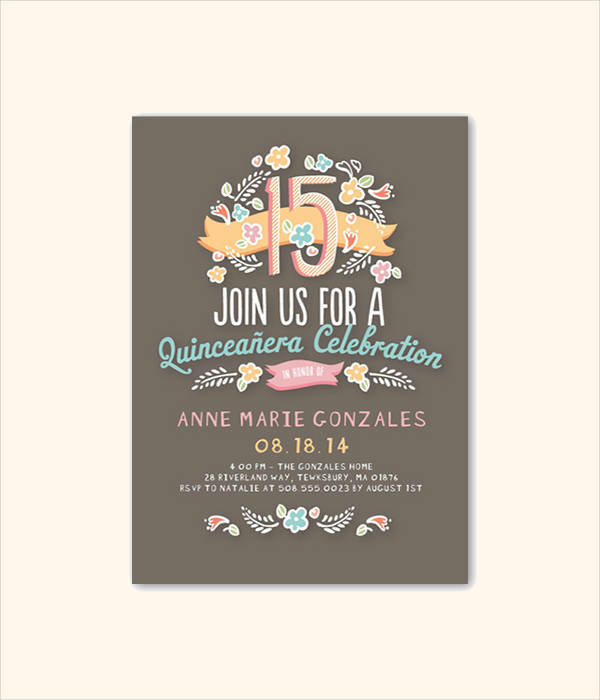 If you are looking out for a free Quinceanera invitation, you can download this template. It has a hand-written message in blue font and looks beautiful, with a natural touch. In case you need a theme with vintage looks, you can download this one. The alphabets are pretty and look refined with the touch of antiquity. The background color goes well with the alphabets here. These are well-designed invitation cards for the special day. The thin and stylish font looks beautiful and you can print it on any surface after downloading the font. This template has an enriched design incorporated into its background. 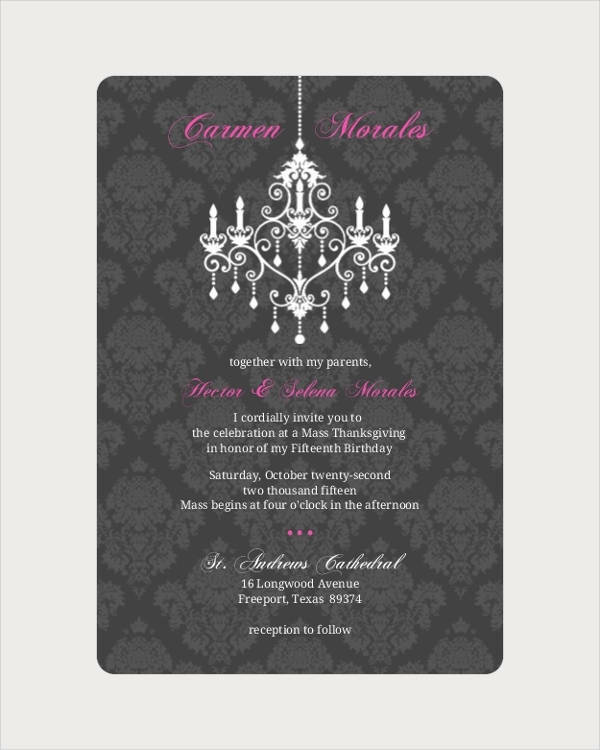 The gray theme looks sophisticated and the alphabets in pink and white look prominent. In this card, the photograph of the girl in incorporated at the top. The invitation message is written at the bottom on a black theme. The white alphabets go well with the dark background. This design is quite innovative and has a lot of graphic elements in it. The blue background with dots looks elegant. The white font color in the cursive alphabets is an idea for this background. This is a pink-based theme with the photograph of the girl at the top. The stylish pink alphabets look cute and the message is written at the bottom in small black letters. The key focus in this invitation card lies on the dress. The pink theme looks sweet and the thick black font at the top is complemented by the smaller ones at the bottom. 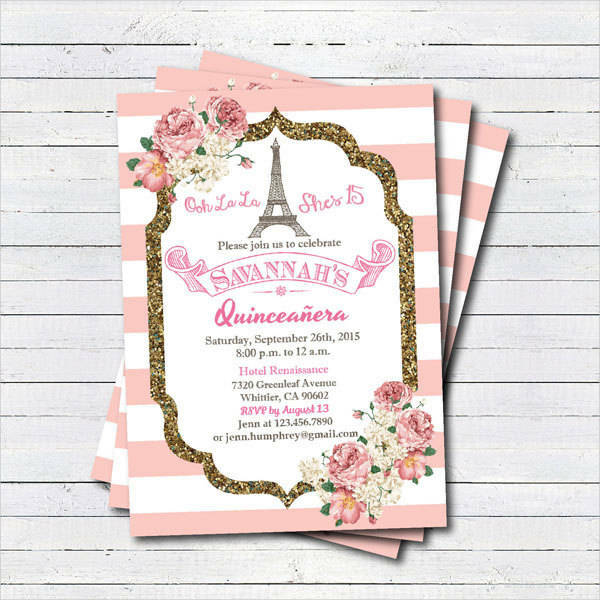 This invitation template is themed like Paris and has several elements in it. The Eifel tower, floral elements, grain-textured borders and the message in various fonts compose a good mix of visual elements here. 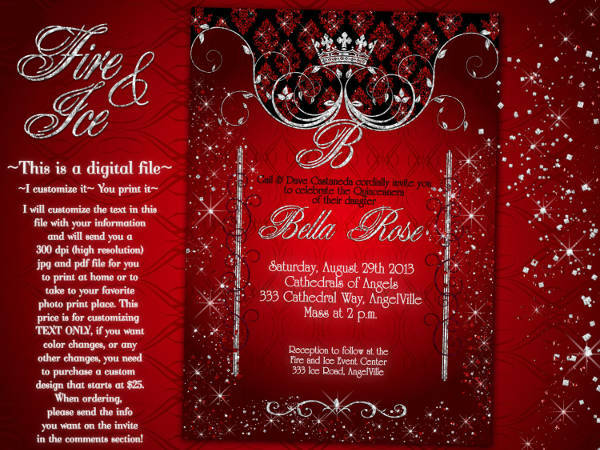 This invitation template has a formal attire and the light background goes well with the deep red font color. You can download it for personalized use. In this template, the pink background color, and the small, thin alphabets in black enjoy a good match. The designs at the top add to the visual pleasure of the template. 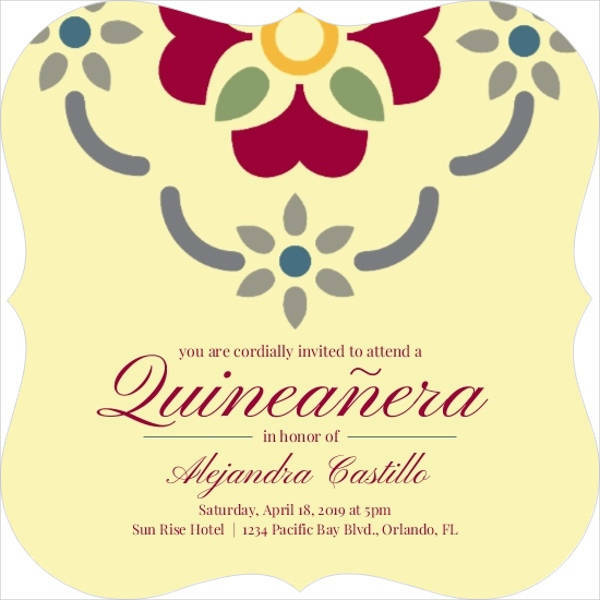 How to use these “Quinceanera Invitations”? 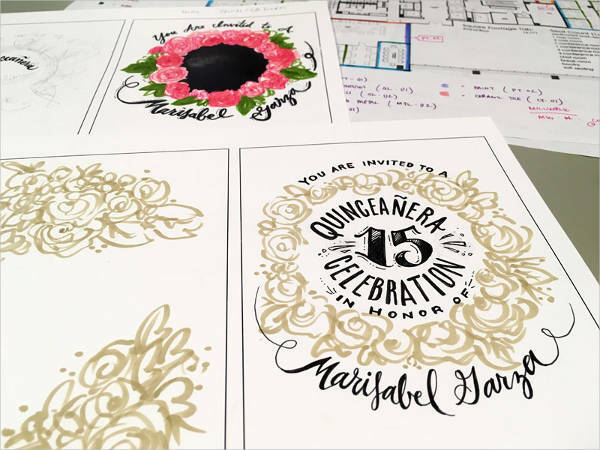 When you look out for beautiful quinceanera invitations ideas, you can simply check out different variations of templates from the website. These are available in the downloadable format. One can edit the message and photograph and get them personalized. 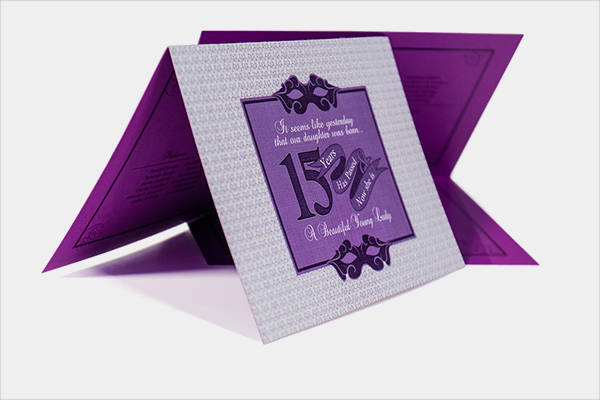 After getting them tailored to perfection, you can download them and print the designs on your cards. 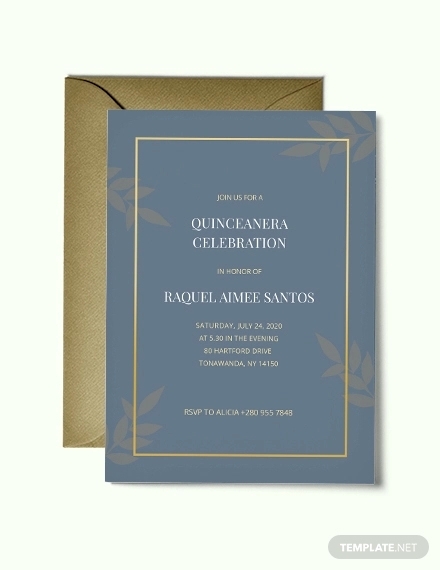 The cheap quinceanera invitations are available for free on the website. You can choose the elements in the templates as per your choice and aptitude. You may also see Graduation Invitations. As the choices of people vary with respect to color, font, and visual elements, you are free to optimize your choice to perfection. If you need birthday invitations, you can go through the pages and get the ones you require. 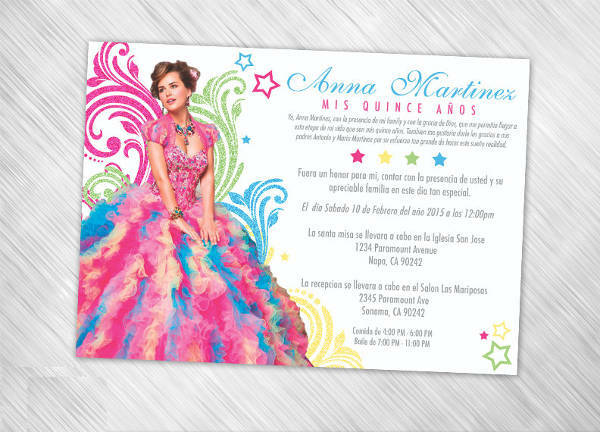 Choose the design that suits the purpose best and retain the personal element in the invitations.